A native San Franciscan, Dennis graduated with a Bachelor of Fine Arts degree from the California College of the Arts. 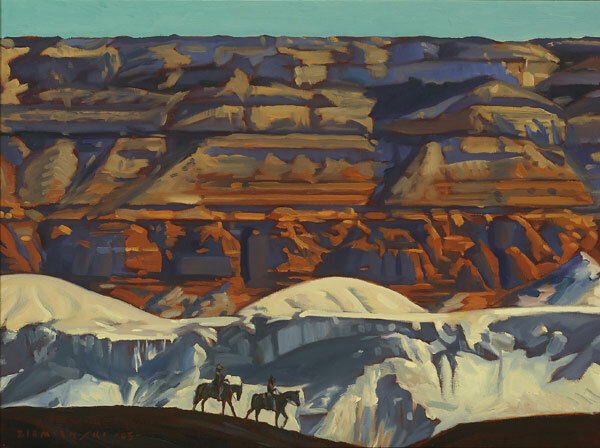 His knack for composition paired with his eye for color gave him a distinctive look and he was able to establish himself as an illustrator in San Francisco. Wanting to explore more opportunities as an illustrator, he moved to New York in 1980. While there, he flourished as an artist, which eventually led him to a successful career as one of the nation’s top illustrators. His compelling poster images include the NFL Super Bowl XXIX and the 2006 Kentucky Derby. His paintings were featured on many well-known book covers including, the Tales of the City series by Armisted Maupin, and several covers for authors Elmore Leonard and James Lee Burke. 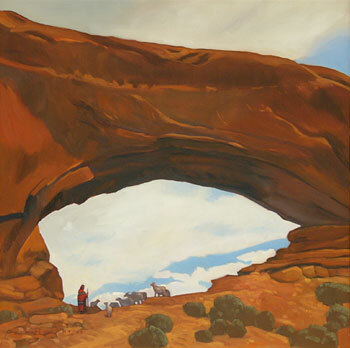 Dennis was the featured cover artist for Hemispheres, United Airlines in-flight magazine, the National Lampoon and, more recently, Western Art Collector, American Art Collector, Southwest Art, and the Jackson Hole Traveler. 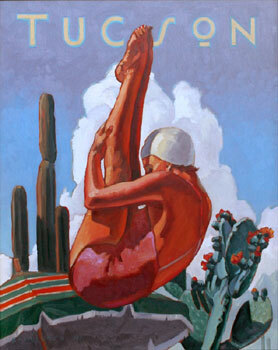 Dennis Ziemienski, Tucson Diver, Oil on Canvas, 30" x 24"
Dennis’ strong and richly colored images borrow much of their inspiration from early 20th century paintings and posters. His early influences, J.C. Leyendecker, N.C. Wyeth, Ludwig Hohlwein and Tom Purvis, were all master designers in composition. The demands of illustration and poster design, with its simplified, sculpturally rendered images gave Dennis the discipline and draftsmanship that gives strength to his paintings today. 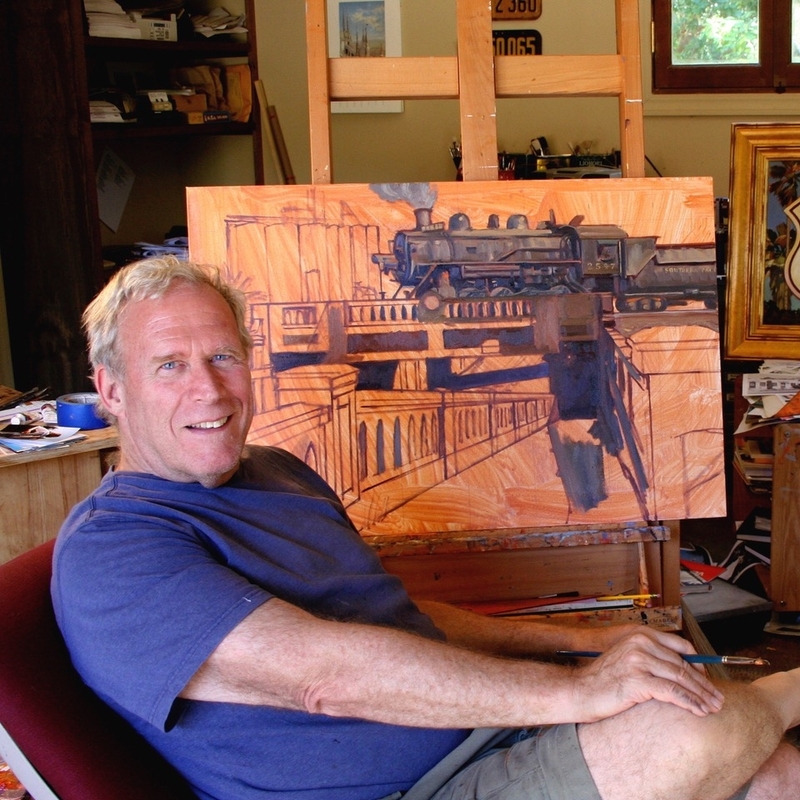 Dennis is not only an artist, but has taught at the California College of the Arts, the Academy of Art in San Francisco, as well as Syracuse University in New York. In 1986 he returned to his roots in California, bought property, and settled in the Sonoma wine country. About this time, Dennis turned his attention to fine art, when continuous requests of his original images were made and private paintings were commissioned. 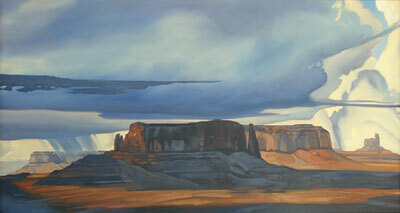 For the last 30 years, Dennis has been painting in oils for his galleries and private clients. 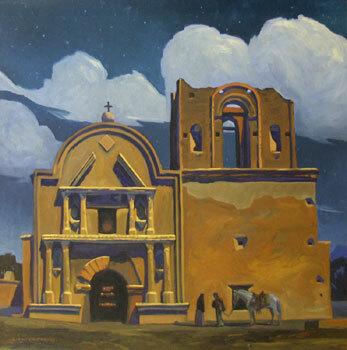 Dennis’ work is in the permanent collections of the Tucson Museum of Art, Bakersfield Museum of Art, the Booth Western Art Museum, Western Spirit: Scottsdale’s Museum of the West, and the Whitney Western Art Museum at the Buffalo Bill Center of the West. Dennis Ziemienski, Cloudburst Amid the Monuments, Oil on Canvas, 32" x 60"
Dennis Ziemienski, Shepherd at the Window, Oil on Canvas, 32" x 32"
2019 Western Art Collector, January, feature article "On the Rails"
1999 Sonoma Valley Magazine, Sept.
Dennis Ziemienski, Navajo Sandstone, Oil on Canvas, 48" x 60"